We first heard of the secret natural hot springs in California a few weeks ago when our friend from the vwcamperfamily group, Melissa, told everyone at the Ocean Cove camp-out about a place she went to on the eastern side of the Sierra Nevada mountains. 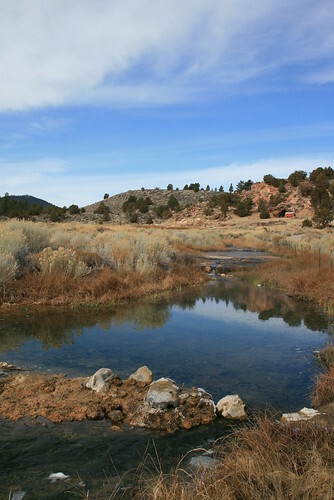 Up on the mountainside, she said she found a place called Buckeye Hot Springs where she dipped in a hot creek, a geothermally heated source of water which drained down the slope creating a creek. Local people in the past made small hot tub-sized pools to retain some of the hot water so that it is nice and convenient to sit and bathe or soak in the nature. After she told us about this place, she pulled out a book which was a sort of guide to Buckeye and 100 other natural hot springs, most of them along the eastern Sierras and in the state of Nevada. We bought our own copy when we got home after that weekend off Amazon.com, and it arrived at our door the next week. We were ready to go find some of those secret soaking spots ourselves! We intended to go last weekend, but the bus was having issues staying running, so we waited until my birthday weekend to go. 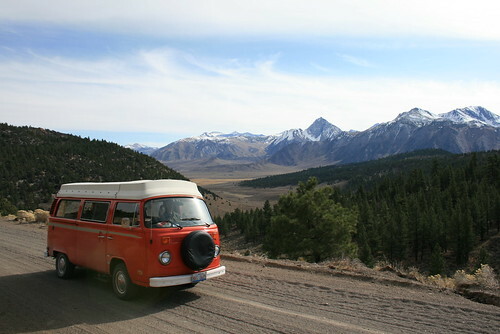 All week Romy fixed up the bus and we cleaned and got it ready for the big trip over the mountains. We left Friday afternoon from Oakland, and our goal was to make it to Reno by dinnertime for a cheap prime rib dinner special at the Cal-Neva. We've been there before with Nicole and Marcel, so we knew it was good. We got so much food for so little money! We ended up packing half of it up in a doggie bag and stuffed it in the fridge inside the bus. Then we continued driving south to Carson City. We were looking for a place to sleep, and we remembered that in Carson City there was a 24 hour Wal-Mart on the south end of town. It ended up being extremely quiet and there were plenty of spots off to the side of the parking lot which were dimly lit and level. For those of you who have never tried it, 24 hour Wal-Marts are a great way to go stealth camping (but not in a tent, of course)! 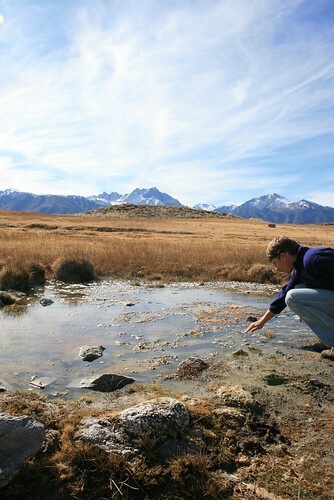 Romy is testing the water temperature of the source of Shepherd's hot spring. The next morning we woke up and hit the road. Many of the hot springs we wanted to visit were near the Mammoth Lakes area, a big ski resort and summer recreation place on the eastern Sierras. My favorite part about the eastern Sierras are how, after steadily climbing higher and higher from the west, they seem to plunge down back to earth dramatically, creating a tall wall of jagged peaks. 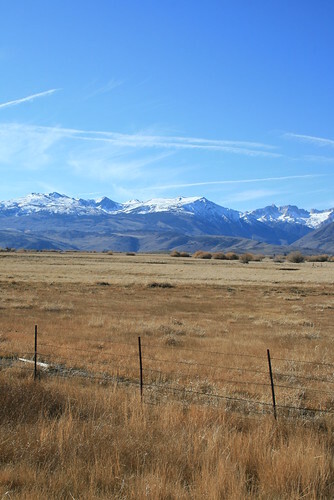 To the east lie a chain of valleys (still at high elevation, roughly 5,000ft on average) and further east rise even more peaks which continue on into Nevada. In the long narrow valleys, there are many natural hot springs, formed when water, which percolates down into the earth, is heated from within and is forced to rise back up through cracks in the earth's surface. 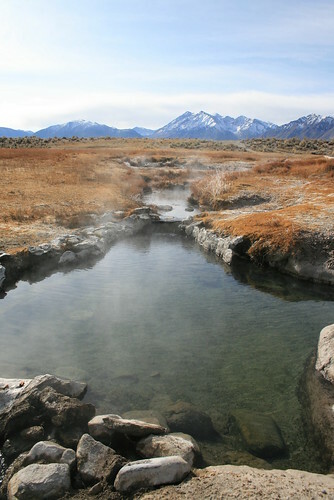 Some hot springs are spewing hot water than once fell as rain thousands of years ago! When you bathe in these natural springs, its like you are bathing back in time. Romy soaking in the tub at Shepherd's hot springs. Most of the natural hot springs are located on public lands, so anyone can go and soak in them, as long as you can find them. Each have their own source, the spot where the hot water comes out of the ground (usually very hot). Like in Buckeye, in the past, some local people created tubs, usually out of rocks and concrete, and plumbed in the hot water from the source to the tub by PVC pipe or simply digging a small ditch which channels hot water into the tub. All are very primitive, but they are wild and free. Developed resorts and spas basically do the same thing, except they build a fancy building and large swimming pools, and charge a lot of money to go swim in "their" hot spring fed pools. It almost seems silly after visiting and soaking in the natural springs because you are so far removed from the natural phenomenon. It is hard to tell if you are swimming in a heated pool, or if the pool is really fed by the hot spring. Swimming at a resort looses its ambiance a little. Jenn in the Crab Cooker as the sun sets. The first hot spring we went to was called Shepherd's hot spring. Supposedly, some shepherds from the valley built the tub out of rock and concrete, so it was named after them. The tub was a little green, with algae stuck to the sides. It needed to be scrubbed out, but it wasn't horrible. The algae is not harmful. The second hot spring we went to towards the afternoon was not too far away, about a quarter mile to the south. It was called the Crab Cooker, because the water at the source is so hot, you can literally cook crab in it! When we found the tub, it had been drained and scrubbed, so it was extremely clean (as clean as a rock and concrete tub can get in the great outdoors). We found the valve and opened it to let the hot water from the source flow in. The tub was within 30 feet or so of the source, so when it flowed into the tub, it was still crazy hot! It burned the flesh, so we had to wait almost 3 hours for the water to cool down once the tub was filled up. We jumped in right before sunset, to our relief, because as the sun dropped behind the mountains, the temperature started to plummet. We were toasty warm in the 105F water, while the air temperature was hovering just above freezing. And this hot spring had one of the best views of the mountains all around us! Romy relaxing in the tub at Little Hot Creek. Being Saturday night, other people were also visiting the hot springs, so we were joined by a group of 4 people from the LA area. They stayed for a while, and we chatted in the tub, and before it got dark, they left. Me and Romy were left to watch the stars in the sky, and the milky way was right above us. When it was time to get out, we realized that it was really cold outside. . . our towels being moist from going in and out before were now frozen stiff in the shape that they were draped over the folding chairs! We quickly shook them out, dried off, and ran back to the bus. Since it was really cold, we pulled out the propane catalytic heater, but sadly found out that we were low on propane, so the heater was putting out minimal heat. So to warm up, we cooked some chili and jumped into the sleeping bags. It was well below freezing, but we were warm in the sleeping bags, finally. 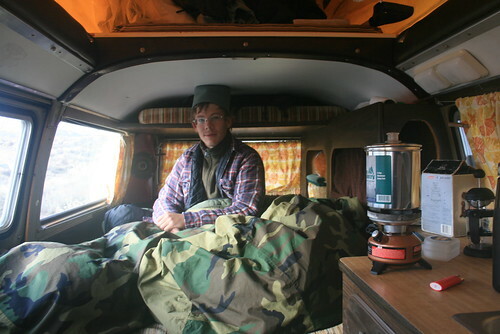 Making morning coffee in the bus. The next morning, after eating breakfast and making coffee, we searched for a hot spring that the people who joined us last night in the Crab Cooker told us about. It was called Little Hot Creek, and they said it was pretty secluded, far down a dirt road to the north. We headed that way and eventually found it, although it was pretty well hidden behind tall sage brush on the other side of the Little Hot Creek which was the source for the tub. There were also good camp spots right up the hillside. Little Hot Creek looks like a normal creek, but it is really warm! After soaking in the Little Hot Creek tub, we moved on to see another famed hot spring called Wild Willy's. It was a short hike down a wooden boardwalk to the source of Wild Willy's. There used to be a man made tub there, but it was removed in order to restore the hot spring back to completely natural. But where the pool used to be, there was still a dug out area where people could bath, although the bottom is more "rough." We didn't swim here because we wanted to start heading back north towards Carson City again, to check out more hot springs in a different area. So far we stayed within a 10 miles radius and saw 6 different hot springs already! The natural pool at Wild Willy's hot spring. The last hot spring we visited was right out of the town of Bridgeport, California (the coldest place in California) and was the most popular. 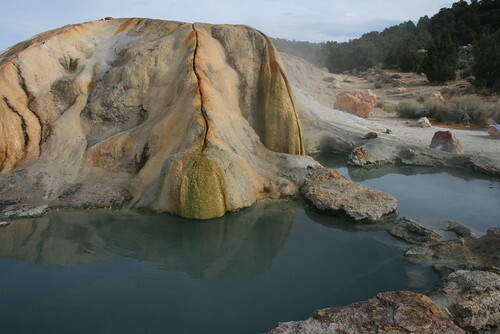 It was called Travertine hot springs, and was named after the travertine formations that form as minerals in the water are deposited (similar to stalagmites or stalactites). There were multiple sources at this hot spot, and there were 3 sets of pools dug out here. The most spectacular were right under the travertine, where locals carved tiny channels to flow into pools which had been recessed into the ground. The pools at Travertine hot springs. We met an interesting man named Lincoln and spent most of the night bathing and relaxing, talking to him, and other people (mostly locals who dropped in every once in a while all through the night). The temperature dropped pretty quickly, so we basically stayed in the pools were we were almost too hot at some times, even bringing our pots, pans, stove, and cutlery pool-side to cook dinner! As the sun dropped, the sky became bright with stars. There were so many shooting stars out, I couldn't believe it (it wasn't even during a meteor shower)! It was awesome! Romy and I at Travertine hot springs. We finally convinced ourselves to get out of the pools at about 10pm or so, and we quickly jumped into our sleeping bags in the bus. That night was the coldest. The next morning, when we woke up, we made some coffee, poured it into our travel mugs, and hit the hot spring to warm up! I never enjoyed a morning cup of coffee in a better location (and it was my birthday!). A local who was walking his dogs walked by and started talking to us. He said that the overnight low was 15F, and that the area around Bridgeport had 10 times as many wild cougars as the rest of the state. I don't know if that was an exaggeration, but maybe. He also said that that morning was the annual cattle drive, where farmers and wanna-be cowboys drive cattle from the valley over the mountains into Nevada where they graze for the winter months. It started getting later and later in the morning, and we didn't want to leave, but sadly, we had to go back home that day. So out we went, dried off, and hopped back into the bus. We will be back! 2) Buckeye was the hot springs that really got me into springs. I had been to Big Sur's Esalen, but hadn't done many natural ones seeking the best. 3) I found the best! It's Wilbur Hot Springs. It is near Clear Lake, north of Sacramento about an hour and a half, north of the bay area about 2 1/2 hours. Now I work for them, because it's power drew me in. It's on a 1850 acre nature preserve, is 100 years old, and the strongest and most curative hot springs I have ever sat in. I really don't know what it is about springs... they draw me... as they obviously did for you. If you are still wandering and want a day pass, I am happy to waive the fee. If you want to stay over at the hotel... I can hook it up. But be sure to contact us first... we are 100% off grid, no cell phone coverage, no internet, and 100% solar powered. I don't usually ramble about our springs, but I was just so excited about *YOUR* enthusiasm for them. you can find out more http://www.twitter.com/wilburhotspring or search us on facebook. Whatever the case... I will be following your adventures! the pictures alone are worth it, and I think I will be posting this on our pages. CHEERS!!! THANK YOU! Michael at Wilbur Hot Springs.